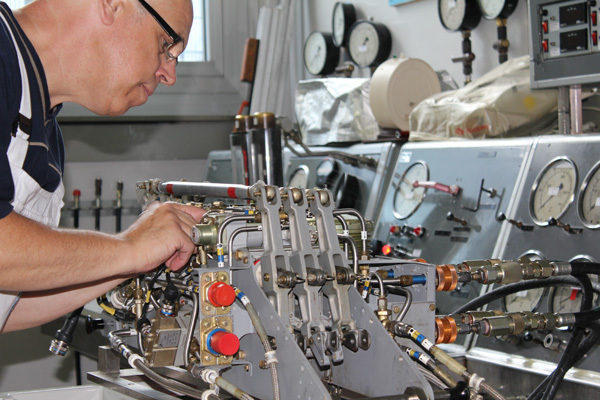 An important core business of MOTORFLUG BADEN-BADEN GmbH is the maintenance and overhaul of many different types of dynamic, hydraulic, mechanical and electrical components. The services for dynamic components, such as gearboxes, swashplates, rotorheads or drive-shafts are handled by our specialists in Baden-Baden Oos. This is also where our team of hydraulic specialists performs overhauls and repairs of hydraulic components with the utmost precision. All electrical assemblies, such as starter generators are performed by the specialists of our electrical department. We work with original spare parts only. Decades of experience, teamwork, knowledge transfer and the close cooperation with the manufacturers of aircrafts and components guarantee quality work and offer our customers greater safety. 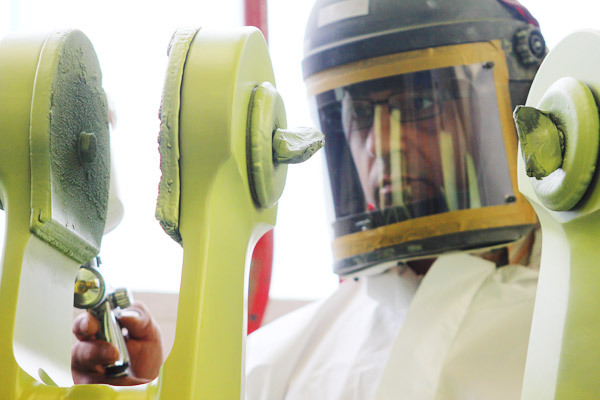 Dynamic balancing, non-destructive testing, crack-testing and chemical free dry-stripping are only some examples of our quality range of services. unscrewing or sanding of washers and bushes or plates just as well as the erosion of broken bolts. Regardless of the type of helicopter, be it a Bell 205, 206,212,412 or Eurocopter EC120, EC135, BO105 or BK 117, we perform repairs on all main- and tail rotor heads. As one of the few aviation companies worldwide, we can also perform the “Run IN TESTS” on main rotors as well as on the 42º and 90 º C tailrotors of the Bell types (models) 204, 205, 212, 412. From simple check valves, the sophisticated flight control cylinders of almost all Bell helicopters right down to tandem hydraulic power unit of BO105 and BK117 helicopters, we do take care of all inspections and repairs in accordance with the manufacturers’ instructions. Given our large range of universal test-stands all parts undergo final testing before leaving MOTORFLUG BADEN-BADEN GmbH. Regardless of the type of helicopter, our specialists in the electric department check and overhaul starter generators of different manufacturers. Electrical fuel-pumps from Bell and Eurocopter helicopters are also repaired, as well as the monitors of the fire extinguishing devices of the BO 105 helicopter. Download Capability List "Electrical Components"
Quality repair of your avionic components. Our experts can repair the instruments of nearly all manufacturers from radio- and navigation device to autopilots, our service center is in cooperation with many manufacturers. Our calibration workshop repairs and calibrates almost all electronic measuring and testing equipment. First-class equipment and a large selection of instruments, checked on a yearly basis in order to adhere to the required regulations, are a given.